Josh emphasized that the challenge to a successful digital signage deployment is keeping content on the screens that are relevant, engaging, and timely. Too often, organizations install a digital signage system, work hard to create content initially, and then six months later, the same content is playing on the screens because no one has made it a priority to update it. Or, the content is not interesting to the employees, customers, and guests so no one is paying attention to it. An effective solution is to harness the power of existing data from internal and external data sources. This data can be programmed to automatically update the content on any screen. 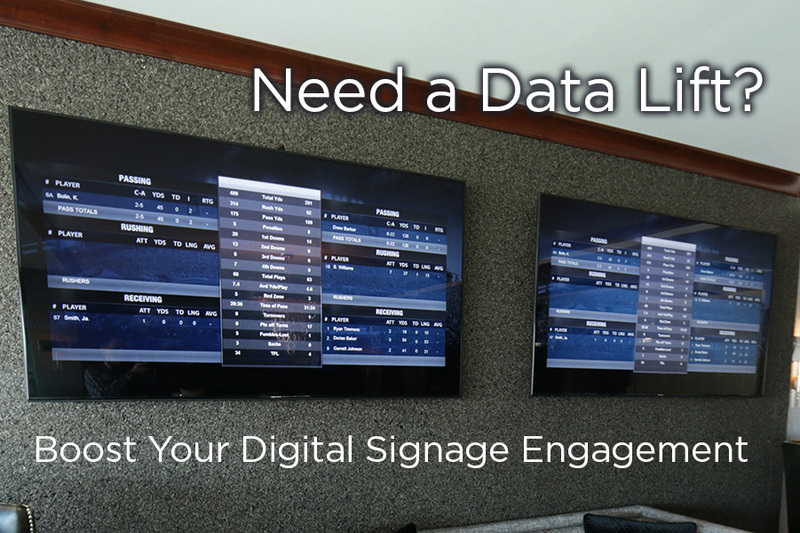 External data feeds efficiently boost digital signage engagement. These sources can be quickly integrated into the systems and are widely offered through subscriptions services. External data feeds provide information on a wide variety of topics including weather, news, local traffic, stocks, sports, trivia, entertainment, and general information. Most organizations will also find subscription services that provide industry or market specific data which will benefit and inform their employees and clients. The most effective way to boost engagement is data from internal sources. Internal data sources include performance metrics, production reports, shift schedules, room schedules, energy data, financial summaries and even lunchroom menus. The key is that this data is already being entered once into an internal data base so there is no need to re-enter it for the digital signs. Internal data sources reduce the time needed to update digital signage and keep the content relevant to the viewers. If you are struggling to keep content updated on your digital signage system or planning the deployment of a new digital signage system, please contact Josh Hoffert at Joshua.hoffert@castnet.com or at 952-841-3363.